With the success of Infor d/EPM, many customers have been asking about what to do with their current investment in CPM and if it’s possible to convert Infor CPM to Infor d/EPM. Based on this we wanted to provide as much information as possible about differences, advantages and options to consider. Infor d/EPM is an advanced and versatile platform for the development of Business Intelligence systems. Financial applications like Consolidation, Budgeting and Forecasting are especially well suited for d/EPM. When compared to Infor’s older platform Infor CPM, d/EPM has several advantages. – d/EPM is a generic tool for multidimensional modeling suitable for many more applications outside finance. Many of these advantages derive from d/EPM’s OLAP engine which is fundamentally different from CPM’s OLAP engine. The main difference is that d/EPM uses on-the-fly calculations instead of pre-processed calculations. This results in practically no wait from the moment data is loaded or entered to producing the Financial Reports. By contrast pre-processing the data in CPM could take time. In some cases that time could be considerable and have a big impact over internal processes. Also d/EPM’s engine is generic and it allows for the creation of multiple cubes and dimensions for many different purposes like logistics, production, sales, etc. In that sense is much more versatile than CPM which targets Financial Reporting specifically. For these reasons many existing CPM installations would benefit from converting to d/EPM. The conversion process involves a combination of new development and reusing the existing development. The strategy used for the conversion process will determine how much of the CPM implementation can be reused for the new d/EPM implementation. An installation that uses CPM will already have many of the requirements for a d/EPM installation. For instance, data extraction process (ETL), proper definition and codification of the business dimensions (Org Unit, Department, Chart of Accounts, …), report definitions, end user requirements. Also the culture and know-how to handle and work with OLAP financial reporting tools will be present. All of these represents a big advantage over an organization that is starting from zero. The design of the new d/EPM implementation can pretty much follow the current CPM design. One of the most important factors to consider is the existing set of reports in CPM. Many times a great deal of effort has been invested over time to the construction of reports. For a CPM installation with tens of reports built over time, it would require a great deal of effort to rewrite them in d/EPM. The good news is that both CPM and d/EPM share the same reporting tool Infor Application Studio. The bad news is that the way the elements are referenced internally is completely different which means the reports will not convert automatically from CPM to d/EPM. Without a conversion tool all the Application Studio reports would need to be painstakingly adjusted by hand. 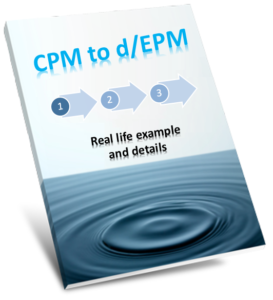 To avoid the scenario mentioned above, we have created a CPM to d/EPM Report Conversion Tool. This tool is capable of automatically converting between 80% to a 100% of each report definition depending on its make up. After using the tool, some reports may still need some manual adjustments, but the brunt of the work would have been taken care of by the tool. The tool takes care of the time consuming, repetitive, tedious and error prone –for humans– task of replacing every code of every dimension referenced in the lists, hyperblocks and formulas that define the reports, as well as allowing global replacement of aliases, cube names and attributes. In order to better take advantage of the tool, the conversion process needs to closely replicate the CPM design. For that reason the d/EPM dimensions and cubes are better converted by extracting and copying the CPM definition from Architect. This process can be automated to a great extent including the footdown formulas in the Schedule dimension. Other formulas need to be converted manually. One area where CPM and d/EPM differ is in the Time and Accumulation Method. Periodic, Period-To-Date, Year-To-Date and Acummulated data in d/EPM need to use special time hierarchies and cube rules to take advantage efficiently of d/EPM’s calculations-on-the-fly model. Another element to consider is the currency conversion. I”m the technical director of a d/EPM partner in the U.K.
We’ve recently been asked to assist a number of CPM clients to d/EPM and I’ve been looking for a tool to convert and found your site on Twitter. Would you be interested in making your conversion tool available for us to resell in U.K./EMEA? Let me know when you have few minutes to talk about this. Please reply to me via Linkedin.